Music Helps Dementia Patients Recall Memories and Emotions, provides engagement and socialization, stabilizes mood and allows the Alzheimer’s patient and caregiver to share a special bond and closeness. Music appreciation and aptitude are the last remaining abilities in patients with Alzheimer’s. Using music is a way to reach the patient even after all other abilities are gone. Music Therapy is a clinical and evidence-based use of music to elicit individual goals within a therapeutic relationship. It is administered by a credentialed professional who has completed an approved music therapy training program. 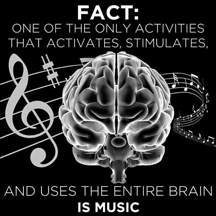 Music therapy interventions is designed to promote wellness, alleviate stress and pain, enhance memory, improve communication, and provide unique opportunities for interaction. BrightStar Care of Delray Beach has partnered with Palm Beach Music Therapy Institute to provide weekly Music Therapy group sessions within Alzheimer’s communities in Boca Raton, Delray Beach and Boynton Beach. We are also proud to sponsor Palm Beach Music Therapy Institute (PBMTI) and their weekly radio show Connections with Bree Beynon.As well as from its home base in Delray Beach, BrightStar Care provides home care services in Boynton Beach. BrightStar Care provides senior care Services in Boca Raton.